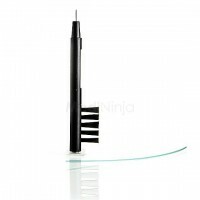 Free shipping, Free return, Free charging base included! Ever run out of batteries unexpectedly? Annoying, isn't it? 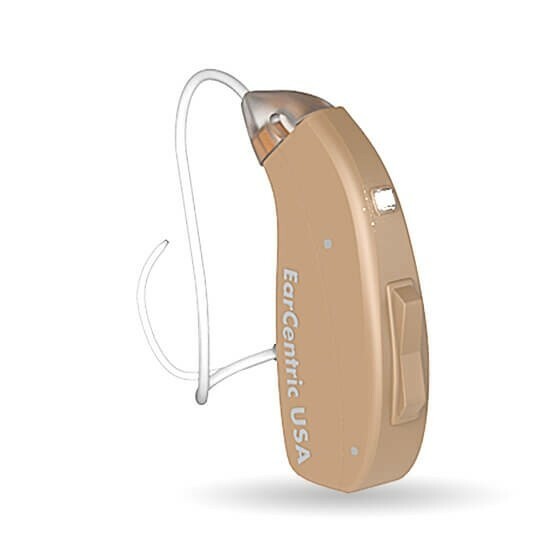 Why not simplify things and say goodbye to weekly battery changes with the EasyCharge Rechargeable hearing aids from EarCentricTM. 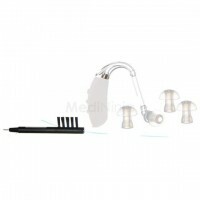 With a very discreet, understated look, this rechargeable hearing instrument has an exceptionally functional design, offering great audiological performance in a very small size. 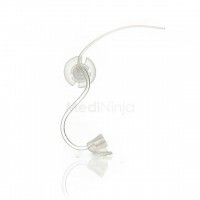 It fits moderate to significant hearing loss and provides exceptional sound quality, especially for high pitch amplification. A double-charging base provides both power and takes care of your rechargeable hearing instrument overnight, giving you the peace of mind to just get on with your day with perfect hearing. 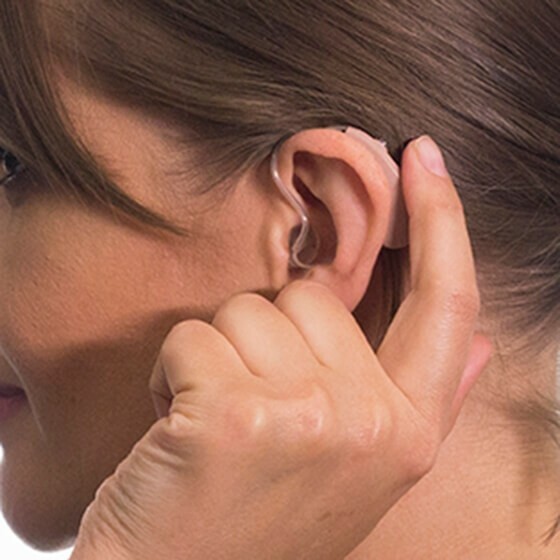 EarCentric EasyCharge combines the digital hearing technology and rechargable power solution into an almost invisible behind-the-ear casing so you can be confident about the way you look and your hearing. You can easily adjust volume and program settings, using the rocker button, to match your surroundings for a completely customized hearing experience. 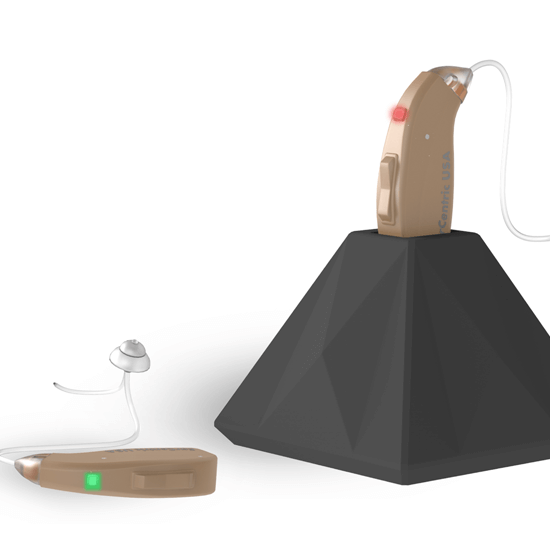 ON/OFF button allows the user to completely shut down the hearing aid anytime to save battery life. Why Choose Us? Cut Out The Middle Man. 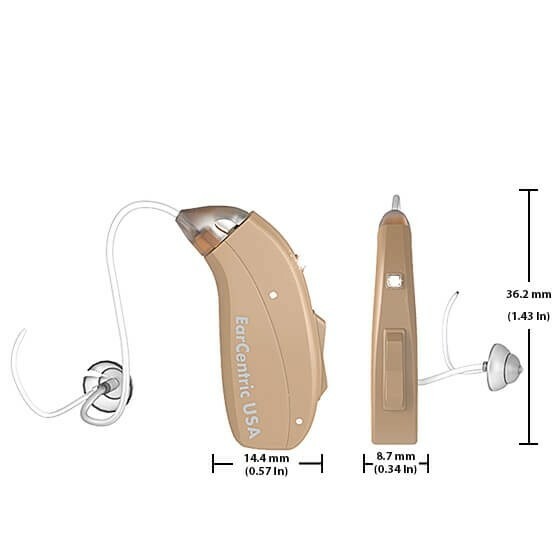 What type of rechargeable battery does this hearing aid use? Do I need to replace it every year (like Starkey Z-Power annual battery replacement)? 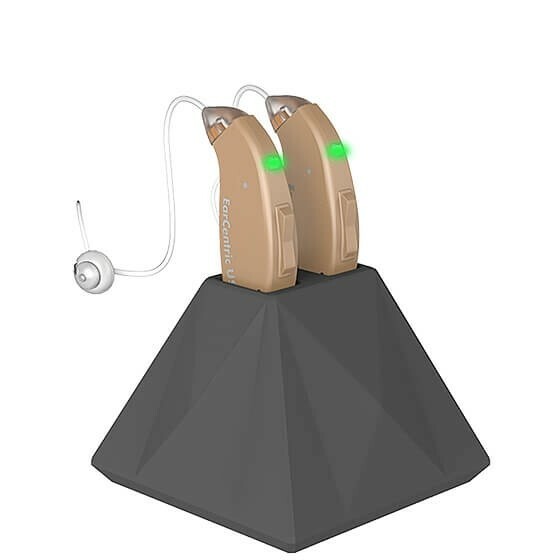 Our EasyCharge rechargeable hearing aid uses lithium polymer rechargeable battery. Just like your cell phone battery. It has built-in rechargeable battery which can be recharged thousands of times. No need to replace it each year. Just like cell phones, people do not replace the phone because of the battery, they purchase a new phone for new technology. My dog chewed my Mom's $2500 hearing aids. Sad! I asked around for replacements. 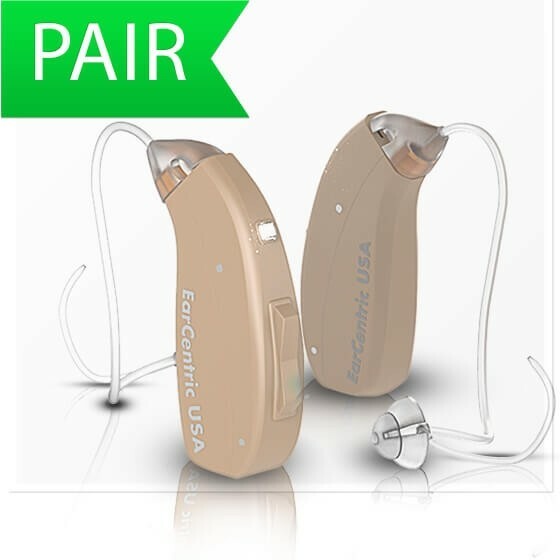 One of my friends' Dad wear EarCentric hearing aids, he said he can hear things very very clear, and he can adjust the volume if needed, but for only $500 a pair. I decided to give it a try. It turns out that my Mom loves the hearing aids. She likes the clarity as well as the small casing. 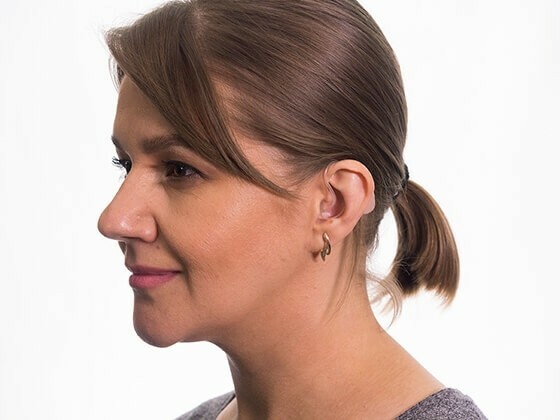 not like her old bulky pair, the new hearing aid can sit discreetly behind her ear under her hair. No one can notice it. She can tackle her hair back. And it is rechargeable so that no batteries needed anymore. She does not blame us, me and my dog. 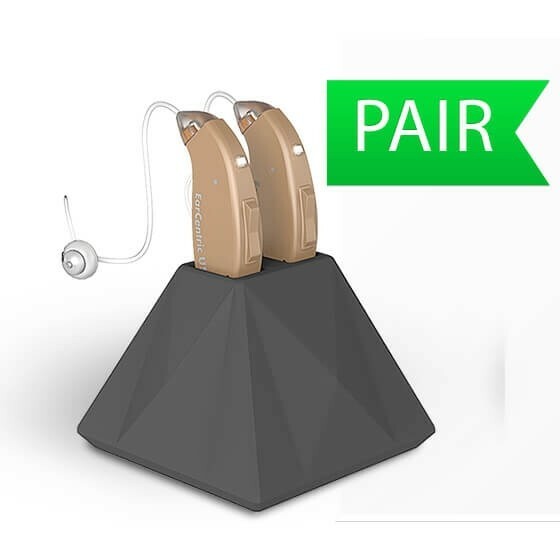 My hearing has improved by using these hearing aids. Thank you for the positive review. Enjoy your new rechargeable hearing aids. Feel free to contact us if you need assistance. These aids amplify the sounds and you are free to wear in one ear or both. These are so comfortable to wear. Just a reminder, Charge them when you do not use them. It will not overcharge because it has built-in overcharing protection. 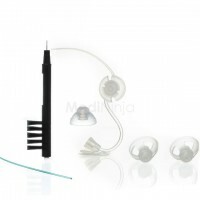 It will give you almost whole day of reliable hearing in just one simple charge. @CherilynR “Almost whole day of reliable hearing . . . . . So how many hours a day can one expect to hear?? Hi Cherilyn, Thank you for your inquiry. 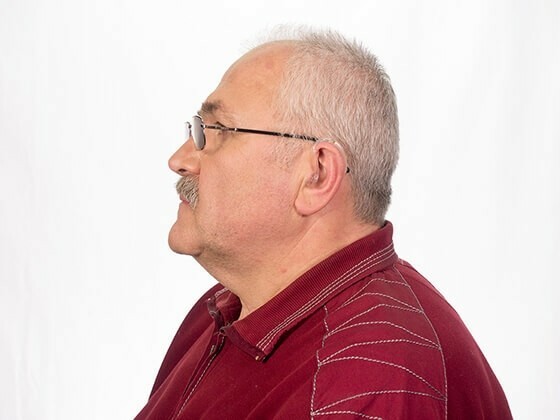 Our ear and brain need to adjust to new hearing aid. Having said that, we highly recommend to gradually increase the hours each day. It is safe to start at least 2 hours of using the hearing aid and increase 1 hour for the following days until you feel comfortable. 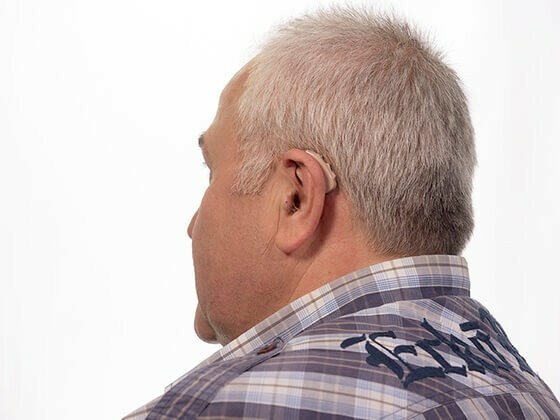 Most of our customers put on their hearing aid when needed like if they watching TV, in a meeting, in a gatherings or when they need to. But if you need to put on your hearing aids all day, that would be completely fine. Hope this helps. If you have further questions,please don't hesitate to contact us via email, call or chat. 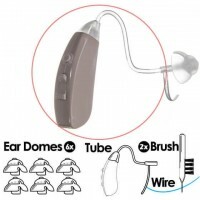 I used there hearing aids just for a day and there are working for me. I will give a full review once I will use them for a good period of time. Thank you. Enjoy your new rechargeable hearing aids. If you need help, don't hesitate to contact us. Till now, your hearing aids are working fine. I am way satisfied till now. Great! Hope you are loving your new easycharge hearing aids. Please note tubes and domes don't last forever. They should be replaced within 2-3 months. If you need assistance, don't hesitate to contact us. Thank you. Is that a good thing or bad thing. Novella? We will have a customer support representative reach out to you. Rechargeable thing is the best but it is very hard to use the buttons at the back to adjust the aids. Just to maintain its performance, it is advised to replace the tubes and domes every 3 months. 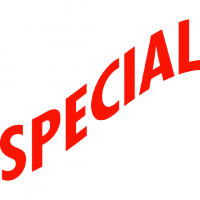 So, when in need just give us a call and we will deliver them as your doorstep. Just after 2 days, my left ear aid stopped working but was apparently repaired by the customer service department. 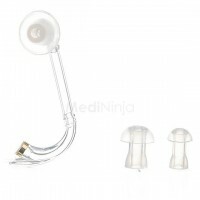 An improvement should be done to make the sound tube longer up to 1/2 to lock the aids at the back rather than on top of the ear. This way your earpiece will stay in place. Thank you for sharing the trick! Loved the recharging feature. I had some problem in adjusting the volume. And my left ear picks some weird noise from window automatically. Just to maintain its performance, it is advised to replace the tubes and domes every 3 months. So, when in need just give us a call and we will deliver them at your doorstep. Working good! The increase and decrease toggle couldn't determine the high or low levels. When one ear is worse than the other one is also hard to adjust. Overall, I liked them because of its low price and good value. Even better Ava. you don't have to change the batteries. This saves you another $200 each year! I was so shocked as these aids are the best I have ever tried. My earlier aids were 20 times costlier than these hearing aids. Its batteries last for almost 5 days and after than we just have to recharge them. One can even save its batteries cost which pays the aids cost after 2 years. You don't have to change the batteries. This saves you another $200 per year! So… a pair over 2 years: 2 x 2 x $200 = $800 savings! This device works as same as my old device. My left ear hearing aid moves out gradually from my ear but other things are working well. Just a reminder, Charge them when you do not use them. It will not overcharge because it has built-in overcharging protection. Almost whole day of reliable hearing in just one simple charge. I normally purchase those hearing aids which can be recharged. I already have LNX2 hearing aids and I am afraid if the Trade off has been worth it. My audiologist had suggested me these LNX2 and he has matched my frequency response curves with the LNX2 frequency settings. But these settings are not the feature of EarCentrics. Can I get a best match for my frequency response curves or I have to use these universal settings only which are not working in my case? Thanks for the review. 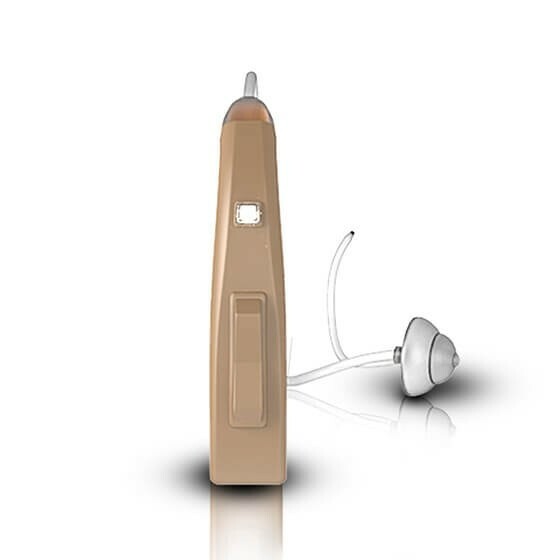 Please note that all our hearing aids are Pre-programmed for the most typical types of hearing loss that is high frequency loss. That is one of the method to keep the prices affordable for everyone and specially for those who can't afford expensive hearing aids. 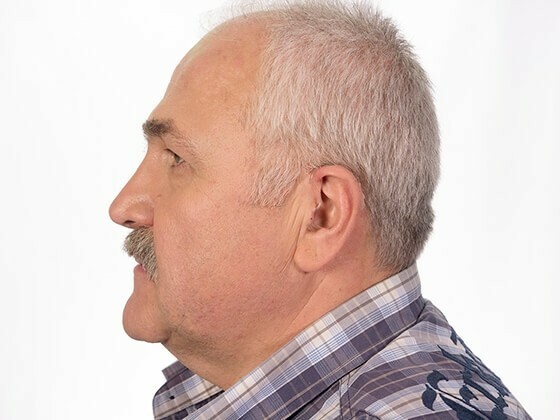 Though these hearing aids works out for almost everyone but we do understand that not everyone get the same results they are looking for. Please let us know if you have more queries. I have received the hearing aids on time and once I have learnt how to adjust them these are working fine. I haven't got the well illustrated instruction manual. I am facing one problem that is the small tube that enclose inside the ear canal is perverted on the wrong way and doesn't stick in the ear. Thank you for the review. Coming to the problem with retention cord or small tube that perverted in your ear canal there is an approach to fit them inside your ears. To make this happen you have to move your fingernail along the side that you want the tube to curl towards; in the same way as you curl ribbon and scissors. Please keep us updated if you need any other help in future. This device has improved my hearing. These aids have improved my hearing and I can easily recharge them. But these aids move out of my ear eventually. And I couldn't even change the volume settings. Thank you for your valuable review. Kindly contact us for help. Initially, at the time of a purchase, I was worried whether these would adjust or not as I wear frames with plastic arms. Once I started wearing them, I didn't find any problem. I need somebody's help to cut down the wider tubes. There is no hassle to change the batteries. Thank you. For assistance, don't hesitate to contact us. 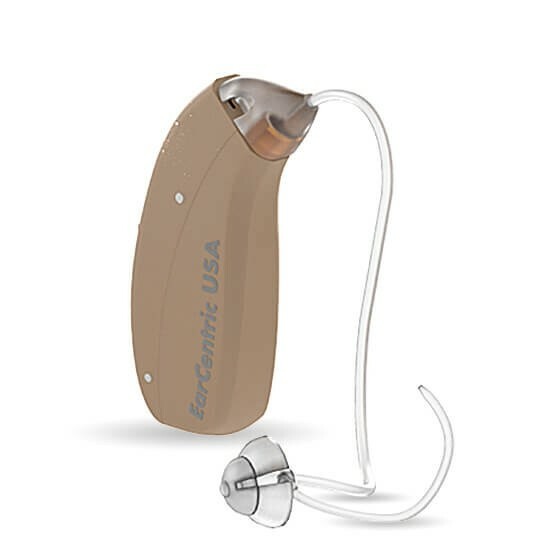 I am fully satisfied with Earcentric hearing aids. The only problem I came across is that I couldn't keep them in my ears for long else I am very satisfied till now. I will surely order the another pair too. Thank you for your easy to use and affordable device. Be patient, Lupe. It takes time to get used to it since your brain needs more time to get the "old" sound back. Its been few weeks only I have started using them. Surprisingly, I began noticing a lot more of the high frequencies like bird chirpping, rustling paper etc. Glad I got this product online. Fantastic review. Donte, thank you! I can feel that how great it would be to hear all those sounds you have been missing for a long time. That's why we do business to give the moments back to our customers. Be in touch and let us know your stories in future too. Moreover, let us know if you want to replace the tubes and domes. 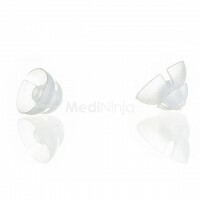 Fully satisfied with this product and it has improved my hearing loss too. Thanks a lot to Medininja who has launched these aids. I wear them as soon as I wake up uptil I go to bed. Charge them when you go to bed. When you are recharged, so are they!